I stayed in Cape Coast between 12th of June through to the 9th August. 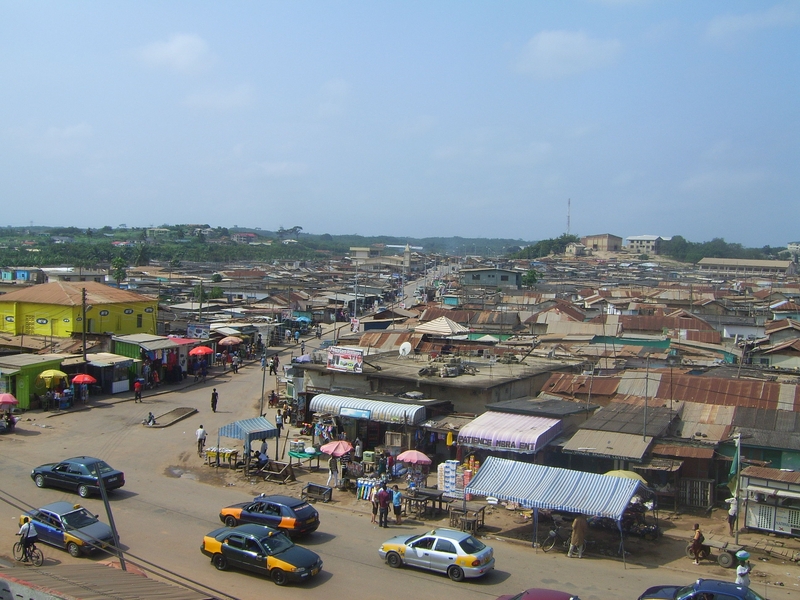 I began my journey from Heathrow airport where I flew directly to Accra airport taking around 6 and half hours, and from there travelled 3 and half hours on a local mini bus known locally as ‘tro tro’. I arrived shortly before lunch time at a local family household where I would be staying for my duration. I was introduced to the mother and father of the house and their small child. I was introduced to another volunteer from Norway; who was also staying in the same house. On my first day I was given an introduction tour where I was taken around Cape Coast by a local guide named Eric, who worked for projects abroad. My first impressions were somewhat shocking, with the heat and humidity, busy streets and noticeable poverty with street food, tin shack houses, homeless people and open raw sewage at the side of the streets. I felt an initial culture shock which was at first quite hard to get used to for the first few days. On my second day I was introduced to my boss who represents rugby in Cape Coast and I was also introduced to the sport council at the local stadium. I was very excited when I was presented with an extremely busy rugby schedule which consisted of roughly 6 hours a day at local schools, colleges and local sides. I then took to my first training session at Cape Tech institute where I met the other rugby volunteers. This initially consisted of 1 English and 1 French lad whom had been out there for a month prior to me arriving. In my second month we were joined by another girl volunteer from America. 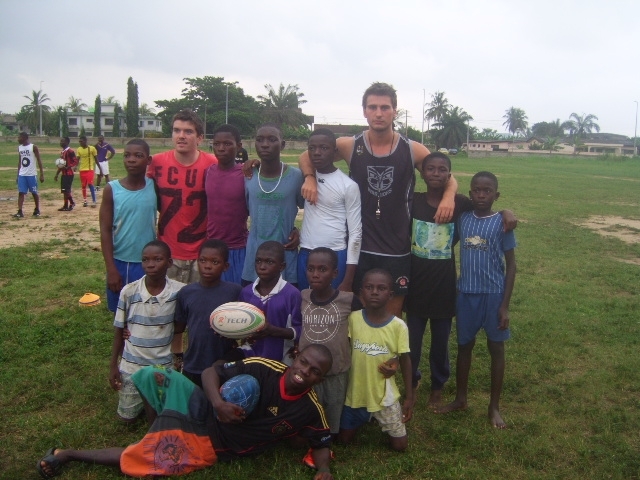 On this same day we took a rugby session of around 25 children aged 10 – 16 in which I thoroughly enjoyed. Every Tuesday night there was an organised quiz night for all the volunteers; in which people are involved in many different projects. There were roughly around 30 different volunteers, continuously changing as new people arrived and old people left. There was a very tight friendship between the volunteers and we would often all go travelling at the weekends, as these were are only 2 days off from the placement. We travelled to places such as Cape 3 point whereby we stayed in a large dorm and we visited landmarks around the area such as the lake situated in the most southern part of Ghana. In terms of my rugby placement, we really did have hectic days travelling from different places. The best way to travel was through shared taxis which you would flag down at the side of the road and were extremely cheap to use. I had a number of schools in which I coached, but I was also assigned my own side which I trained solely on my own. This team was Adisadel College, consisting of male students between the ages of 16 – 18. When I first entered the college the lads had never seen a rugby game let alone every played it. As football is such a dominant sport, my first few weeks were difficult to say the least; to coach a sport they had never heard of. I started with easy games such as bull dogs charge to try and introduce certain aspects of the game whilst also creating an element of fun. Over the 9 weeks with this team I trained them every Tuesday and Thursday when they had finished college whilst increasing the complexity and intensity of training sessions. I can confidently report the transformation from week 1 to week 9 was unbelievable. 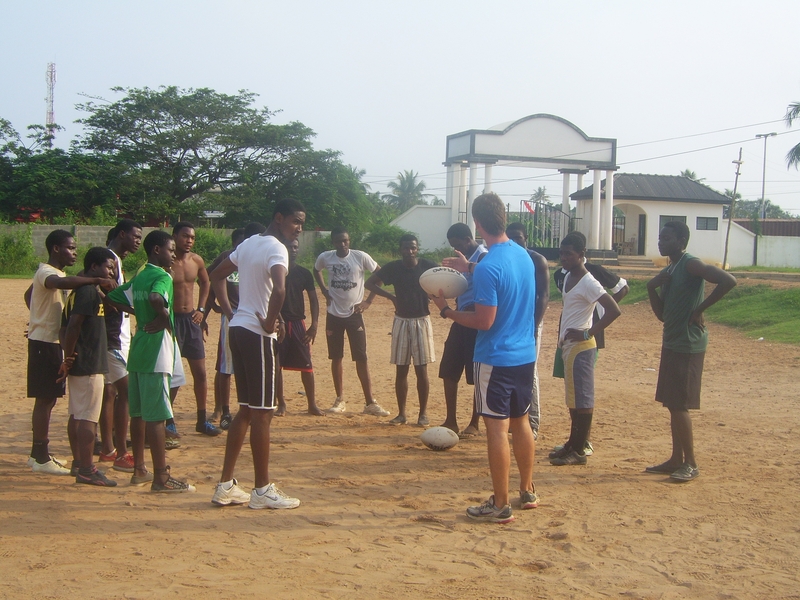 In my final week I organised a competition whereby my side played another local side; coached by my rugby boss. Alongside this game we had a few of the junior teams playing each other prior to the main game. I am happy to say my team won, and the pride and excitement afterwards was extremely rewarding. Whilst out in Ghana, I made a lot of lifelong friends from all around the world as well as getting to know a lot of the local people who pride themselves of being extremely friendly and a very proud country. I loved the way of life whilst out there “extremely laid back” but the only thing I am not missing, now that I am back home is the food. There is only so much I can take of goat meat and white rice! I found this trip extremely rewarding, and the enthusiasm the children showed on a daily basis for a sport that is relatively new to them was very encouraging! Many of these children would turn up on a daily basis to the local team I coached called Cape Tech, with determination and enjoyment, even when poverty was so apparent and many would arrive barefoot or having no money for water or food. On leaving I provided a number of pieces of equipment to help the cause carry on developing which included clothing, rugby balls, whistles and medals for the children. This was one of the most rewarding and exciting experiences I have ever had the opportunity to participate in, and I know one day I will return to Cape coast also known as the “gateway to Africa”! I would like to thank you for your financial contribution towards the trip, which helped me fund the placement, flights and equipment I took over there. A lot of the money which is given to Projects Abroad goes directly into the local community helping to fund worthwhile projects such as the placement I was on, and it really does make a huge difference! Thank you for your support as it was very much appreciated by me and all the children and young people who were given an opportunity of participating in the game of rugby. On the 31st July, myself alongside 7 other volunteer’s travelled out to a small, economically deprived village called Bahti, which was situated on the outskirts of Nakuru in Kenya. Our main outcome out of the trip was to improve facilities of the local nursery which was provided by Pendana in 2010 due to childcare provision being very limited in the area for working families. Alongside improving the nursery facilities offered to the local children, we were to provide a programme of educational classes for the local children while they were out of term time. Before leaving for the project, we began having team meetings with the organisers of Pendana who advised and supported us in discussing our main focus for both the nursery and educational classes. We understood that education differed from the schooling received over here, with one major difference being how problem solving was taught in schools over there. As a team we decided this was our angle to focus on, however ensuring that we made the lessons as fun and as enlightening as possible. Therefore we made a list of different themes we could incorporate into our lessons, for example ‘myself’ ‘families’ ‘around the world’ in order to collect resources between us and bring them over. From that list we bought a variety of books for all ages, paper, stationary (pencils, wax crayons, colouring pencils etc.) outdoor equipment (skipping ropes, hoops, softballs, tennis rackets etc.) arts and craft activities (paint, straws, chalk, masks, face paint, playdoh etc.) as well as resources to use for the lessons planned. Due to being unaware of children’s ability and what to actually expect, many resources taken over were for the nursery needs. Baby bibs, soft toys, soft books, teddies and clothing to name a few, alongside decorative boarders, posters and material for the nursery wall was purchased to take over because we couldn’t guarantee what would be available out there. The organisers of Pendana had been informed about a few requirements the head nursery worker had wanted us to do in our time in order to improve the nursery, however once we were in that setting we for ourselves could distribute part of the budget to the most important both herself and we felt. In order to take part in the project, each of us had to fundraise £1000 which would go towards the budget; however we still needed to raise our own money for flights, vaccinations and general living costs while on the project. Between us we managed this, and before long we arrived at Kototo Crèche in Bahati. When arrived we did not expect to see the extent of what we saw. All of us were overwhelmed by the nursery and the children; no one could have prepared us mentally for this. The children were laid in a room soaked in urine, with no toys, little comfort and hardly any visual or mental stimulation. We began to realise we needed to go back to basics and build this nursery from scratch. We had to take into account the children’s home life, we understood that we had to implement a routine for hygiene in order to prevent spread of disease’s and improve basic sanitation, not only implementing this but training the nursery staff to ensure this carries on. After witnessing this, we ensured enough was put aside in the budget to build a solid foundation in order to improve health and hygiene to ensure children received a better quality of life, at least in the crèche. First on our agenda was introducing a system for nappy changing to the staff, as previous to this, children were left throughout the day in cloth soaked in urine causing distress, rashes and severe blistering. In conclusion to this, we provided nappies, creams and basic hygiene equipment such as gloves, disposable nappy sacks and baby wipes. We also provided potties; with the encouragement of the other staff we used this to impose a regular time for the children to use the toiletry equipment. This ensured that children began developing a routine to use the toilet instead of soaking themselves. On arrival, we did not realise the severity of the condition in which the nursery was in. The walls were damp causing a musty smell, attracting flies and leaving the children with respiratory problems. There were no chairs, tables within the building for neither staff nor children, so they had to use the cold floors which provided very little comfort and limited the interaction between the staff and the children. From this, we bought chairs and tables suitable for both staff and children to use which went inside the nursery playroom, and paid for local fundi’s to build wooden benches and tables to go underneath the outdoor shelter. To enable children to lie down and play on the floor in comfort, we put lino on the floor to cover one half of the room, filling this with PVC mattresses, blankets, pillows and cloths so that if children did have an accident, the material could be easily washed eliminating problems of further dampness to the room. The nursery had no running water, so staff had to use the local well in order to cook and clean, however due to the water amount being restricted, the children were not provided with water throughout the day. This became another priority to change, as with the heat and humidity, children became dehydrated and mal-nourished rapidly. From this, we installed a water tap and paid for the running of this for a further twelve month period. With regards to the walls inside the playroom, we purchased gloss paint so that any marks could be wiped away leaving the room feeling fresh and looking visually respectable. Not only did this add visual stimulation for the children, it also helped tackle the fly infestation and got rid of the musty smell. We purchased insect attractant and displayed this near the windows and doors of the nursery to try keeping this problem at bay, purchasing enough supplies to enable the staff to do this. With regards to the children’s toys, due to the nursery having no cupboards, toys bought previously would go missing due to A) there being no lockable storage facilities B) the fence in between the local housing and the nursery was too low and did not make the nursery secure. From this, we paid for local fundi’s to install lockable cupboards inside the playroom, and for them to erect a fence high enough to keep the children, staff and the nursery belongings safe. With the fence up, we paid fundi’s to build a set of swings for the children to play outside with, as previous to this the only outdoor playing equipment they had was a rope tied to the shelter which was badly damaged and unsafe. The swings were supported by a steel frame, with three different swings, including a tire swing. The base of the frame was then dug deep enough into the ground to support the structure in order to provide a safe environment for the children to play in. While we were there, it was visible to see the passion the head crèche nurse, who lived on site, had for the children. She was eager to learn and over the period of time we were there she had learnt a lot about how to improve the crèche and the children’s health while under her care. 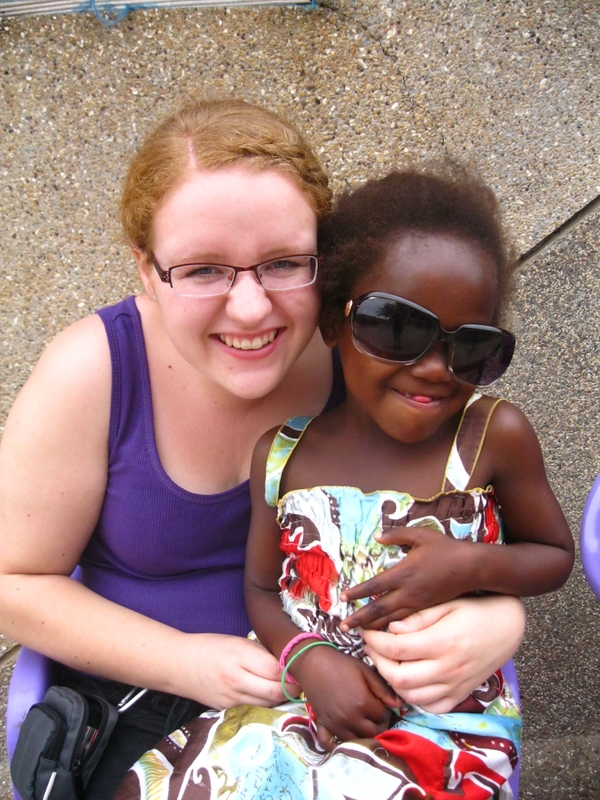 However, one of her daughters Angel (Hannah) was 7 years old with Cerebral Palsy, and due to Kenya being a less economically developed country, care out there for her was very limited and often they were unsure in how to deal with this. She spent most of her time inside, laid down on a mat with limited interaction from staff and other children. This became heartbreaking, and so alongside modelling appropriate behaviour towards Angel, we decided to purchase a children’s wheelchair for her so that she could be included in all aspects of the crèche life. To see her face light up as she could see what was happening, to see other children interacting with her, to see her included in activities when usually she would be left alone was one of the highlights of the whole experience. Having the opportunity to give a child a gift that would change their life for the better is a memorable experience and something I will never forget. From the 16th July to 8th August 2011 I attended a volunteer placement in the Limpopo province of South Africa with Limpopo Education Support Services (L.E.S.S). With the help of funding from the Eleanor Peel Trust I can say these were the best three weeks of my life! The generous funding helped towards the cost of my flight and also to purchase some well needed educational resources for my placement school. On the first day we went to visit a selection of projects we could work on. The first school we visited was Boschdraii, we met some of the children and teachers and the children gathered to sing some songs. This was very overwhelming at first, the children sang and danced beautifully with such happiness and did this without any guidance from their teachers. I knew then this is where I wanted to be placed. The school was on a farm just a 15 minute walk from the accommodation. There were around 70 children who were organised into 3 classes. Grades 1-3 aged from around 4-8 grades 4-5 aged from 8-12 and grades 6-7 aged from 13-15. I choose this project mainly because it was a typical African primary school which had limited resources. I wanted to challenge myself into teaching without normal resources but also make a difference to the children by improving their English and Numeracy skills. 5 other students choose to be placed here which helped as we could all support each other. I spent my time teaching English and Numeracy to grades 4-5 and 6-7 but occasionally taught in grade 1-3. Other lessons I taught included PE and science. The day started at 8.00am where children would gather for an outdoor assembly, sing songs, listen to information given by their teacher and pray. The assembly would end by the children chanting ‘good morning teachers’. In the early hours of Monday 25th July 2011 I set off with a group of 12 girl guides and guide leaders fromNewcastleInternationalAirport travelling toKumasi,Ghana. 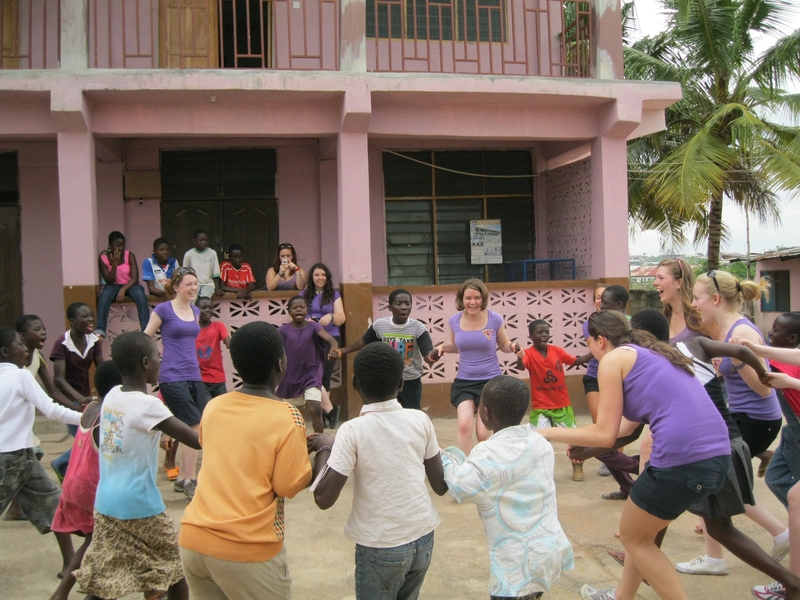 It had been a long two years of fundraising, selecting the group, booking flights, planning activities, games etc and an educational programme to do at The King Jesus Charity Home, but we were eventually on our way. Girlguiding Newcastle has had link with The King Jesus Charity Home for over 10 years, this is via a Guider whose husband is a Ghanaian chief. We travelled via Brussells ontoTogoand eventually arrived inAccra,Ghana. Arrangements had been made for our first night to stay at the Girl guide Training Centre in Ashimota. It took the group a full day to travel fromAccraup toKumasi, by bus, where we would be staying with Jean and Joe (Ghanian Cheif) for the next 3 weeks. On the way toKumasiwe visited Aburi Botanical Gardens, we were given a guided tour of the gardens. We were all impressed by the outstanding beauty of the plants in the gardens from trees that you could climb inside of, to plants that closed up when you touched them. Our last stop on our journey up toKumasifromAccrawas at the Cocoa Research Station. It is here that work is being done to look at different ways in producing the highest quality of cocoa bean. We were shown around the site and were given a detailed talk about the process in which the beans go through before they are made in to cocoa. We were given a sample of a raw cocoa bean to eat. The pulp on the outside was very sweet but the bean itself was bitter. Our next few days were spent acclimatizing to the heat and humidity, exploringKumasiitself and getting to understand the Ghanaian lifestyle and people. We visited the wood carvers at Ahwiaa, while there we experienced “haggling” for the goods the we wanted to buy. Next stop was at Ntonsu to have a go at Adinkra stamping. We all experienced how to produce the dye and also got the chance at producing our produce woven cloth, the girls watched the intricate patterns being woven and were given the chance to try the weaving themselves. The Ghanian people produce the most fantastic and intricate goods using very primitive equipment. The next day we arrived at the orphanage to a lot of excited faces. The children had been told we were arriving and came out to greet us. The first few days at the orphanage were spent getting to know the children and staff. On the first day the children took us into the local village to show us around. Two of ex residents from the orphanage now have small business in the local village, one being an electrical repair shop and the other being a wedding dress shop. It was lovely to see that they had been given the chance to earn their own money and that their future was full of hope. The other adults and I then had a meeting with Pastor Kofi about the projects that we had planned for the orphanage. Pastor Kofi is the founder of The King Jesus Charity Home. The orphanage building itself was originally Pastor Kofi’s home, over the last few years it has had a lot of renovation work and extensions added to it. As the number of children living at the orphanage grows so does the buildings. It is an ongoing battle to fundraise to cover costs. The aim of the orphanage is give children a chance to make a life for themselves by educating them, whilst having somewhere safe to live, good food and decent clothing to wear. The younger children are allowed to go to the local school until they are eleven. The older children are encouraged to work to make money for their keep whilst learning a trade which they can rely upon once they leave the orphanage or go onto further education, which has to be paid for. The staff are mainly volunteers and when it comes to feeding the children they can only use what is available at the time. One problem being that they cooked lots of starchy food as this filled the children up and there was very little in the way of vegetables, fruit, protein etc being used even though it was available. 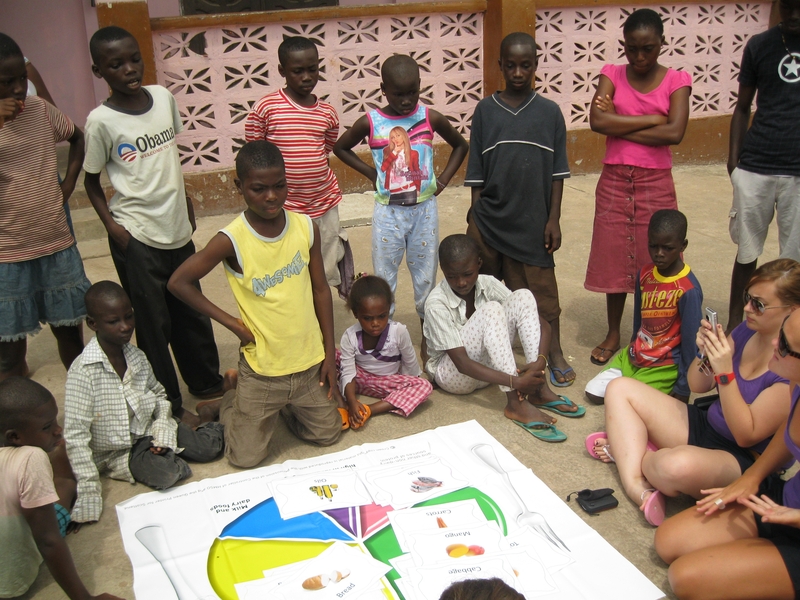 One of the main activities for the children was to teach them about nutrition. This was done with the help of the activities that we had planned for them. We had a “eat well plate” which had been donated byNewcastleupon Tyne NHS Trust, this played a large role in the teaching of the children. We played games using colours, food groups etc and everyone enjoyed the challenges. The staff took an interest and after a few days we saw a difference in the food being cooked. We had planned to buy goats which could be used for milk, cheese etc but when we arrived someone had already donated some goats and pigs otherwise known as the “troublesome creatures” and the staff and children were getting used to looking after them and milking them. As we had fundraised to buy the goats which were already there, we decided to use the money on other much needed things. The cooking area was outside as most of the cooking is done over open fires. However there was a room which had on occasion been used when the rain made it impossible to light fires outside. Unfortunately they had lit “open fires” in the room and the walls and ceiling were blackened with smoke and soot. A company had donated two wood fuelled stoves which had not been installed. Our group set about cleaning the room, we scrubbed the ceiling and the walls with the help of some of the older children and the stoves were installed. We used some of our money to pay for a sink to be installed and are waiting for the water supply to be connected. This will not only be a safer place to cook but cooking pots etc can be cleaned and stored in the room. The library was on our list of jobs to do. We cleared the room and cleaned it before setting up the “library”. There were lots of books which had been donated but most of them were still in boxes and cupboards. Everything was sorted and put on shelves which we then labelled with colourful labels and stickers. There were chairs and tables for the older children to use but nothing for the younger ones. Some of our money was used to buy tables and chairs for the younger children, enabling everyone the use of the library. Two of the older boys have now taken charge of the library and will make sure that everything is kept in order. There was an open drain which ran through the orphanage site. We had heard that on occasion some of the younger children had actually fallen into it. This had to be a priority and as a group it was decided to get builders in to put a proper cover over it and make it safe. No sooner had we said we would pay, the materials arrived closely followed by workmen. Some of the older boys from the orphanage were happy to help and even some of the girls from our group joined in to get the job done. The younger children are able to share bedrooms, however as they get older Social services have said that separate rooms are needed. The third phase of the orphanage, the girls block, has only just begun and will take some time and a great deal of money to complete. Pastor Kofi had been able to “buy” the house next to the orphanage at a very reasonable price. A deposit had been paid and fundraising was underway to make payments. As a group we had enough money left to pay the next instalment on the house for the girls and fundraising continues. We worked hard but also had great fun working at the orphanage. The children were amazing and so grateful for the smallest things and the staff do a fantastic job in extremely difficult circumstances. After three weeks it was time to leave and I think every one of our group would have willingly stayed longer. It took two years of fundraising and generous donations to cover the costs of my expedition toGhana, but it was really worth all the hard work. I would recommend a venture such as this to anyone who doesn’t mind hard work and would like to make a difference to children’s lives. I will continue to support the orphanage and plan to return sometime in the next few years. Many thanks to the Eleanor Peel trust for your generous donation, you can rest assured that the money was well spent and most gratefully received by all who live and work at the King Jesus Charity Home for Children.